Also, if interested, I'm having a gemsona contest on my tumblr, and there are already a lot of lovely entries, many of them from dA! Ends May 30th, 2015! Really nice... Steven's hair looks just like KO I swear. The way the gems in this picture in particularly glow drives home the idea that, at the very least, these are a series of pictures about Steven and the Gems being hypnotized/controlled by the gems and their physical forms are adjusting to the gem control. Gonna be honest, when I first saw this on it's small size I almost thought Pearl was wearing a bathrobe. Out of all of them, definitely gotta say this is my fav, if not just because Lapis looks so incredibly at peace. By far my favorite of these! Steven just became KO (From OK K.O.)! Why the Fav is disabled? They're all so beautiful and majestic! My favorite one so far! I love this one! everyone looks amazing as Lapis! I see Bob, and Bob, there's Bob, and here's Bob, Bob over there aaaaaand Bob. lol! Bobs get over hear! Nice, I really like the lighting! AKA Pearl in a blue robe. Can I make request / Commission please? SO CUTE!!! I LOVE LAPIS! Pearl Lazuli is best Lazuli. I gotta say I love Pearl's outfit here a lot more then her canon outfit Top job! They look soooooooooo good! 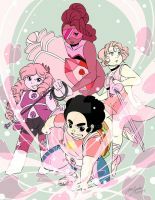 My favorite Crystal Gem in this pic is probably Garnet!!!! Their outfits are beautiful!! Also I love your reactions! Keep up the good work!!! Steven Lazuli looks sooooo good! !